GAURA PURNIMA - MARCH 20TH, 2019 ~ The Toronto Hare Krishna Temple! 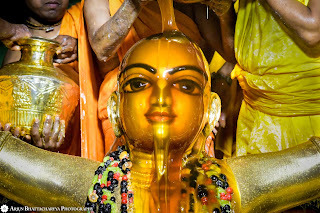 Join us at the Toronto Hare Krishna Temple on Wednesday March 20th, as we celebrate one of the biggest festivals of the year, Gaura Purnima, the appearance of Chaitanya Mahaprabhu! Chaitanya Mahaprabhu is none other than Lord Krishna Himself. He appeared in the city of Navadvipa in Bengal in 1486. Throughout His life he practically demonstrated how to follow the teachings of Lord Krishna with love and devotion in the simplest way. He inaugurated the Golden Age amidst the age of Kali and established the chanting of the Holy Names of Krishna (Sankirtan) as the Yuga Dharma. He generously distributed His teachings to all the fallen people without any discrimination and rekindled their love for God. In this way, He personally exemplified how to be a pure devotee of Lord Krishna. We will be celebrating the auspicious appearance of Chaitanya Mahaprabhu in the evening at 6pm at the temple. The program will include a special Abhishek, beautiful Darshan, a wonderful presentation, sumptuous vegetarian feast, and much more!